The MAIA network has chosen to present the Atlantic arc marine protected areas defined and recognised as such by national legislation in the UK, France, Spain and Portugal and meeting the IUCN definition. In the past, these countries have used various legal tools to protect nature, referred to by the term ‘designation’. Information about all these marine protected areas is currently being collected as part of the MAIA project. Therefore, it is not yet available in datasheets or visible using the map tool on this website. - Stage one involves collecting ‘standard’ data, i.e. standardised information that the countries submit at European (Common Database on Designated Areas – CDDA) and global level (World Conservation Monitoring Center / World Database on Protected Areas WCMC - WDPA). This data concerns standard perimeters (polygons) and attributes (name, designation, status, date of establishment, etc.). 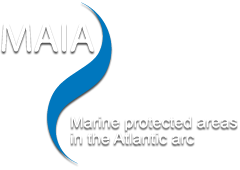 - The second stage aims to gather detailed information for further knowledge and improved assessment of the Atlantic arc MPA network (called MAIA attributes). Information concerns site management, resources available to managers (human, technical, etc. ), applied regulations, species and habitats found, etc. The MPAs in the UK, France, Galicia and Portugal should be integrated into the MAIA database by the end of 2012. The MAIA network does not interact with the flow of official data; it only uses the data provided by the national focus points (organisations in charge of collecting and disseminating protected-area data on a European and international scale). However, the MAIA network does encourage partners to work closely with their national focus point so that EU (Common Database on Designated Areas - CDDA) and global databases (World Conservation Monitoring Center / World Database on Protected Areas WCMC – WDPA) are kept up-to-date. Je viens de consulter cette page, http://www.maia-network.org/homepage/marine_protected_areas/an_ongoing_process, je te la conseille.